Sprockets play an integral role when conveying product. Whether it’s on an assembly line that runs 24/7 or an agricultural harvester used annually, production halts when sprockets don’t perform. Longevity of sprocket life is not only beneficial in initial sprocket cost and downtime, but also in the life of the chain. When sprocket wear occurs, chain life degrades due to sprockets no longer in pitch with chain. 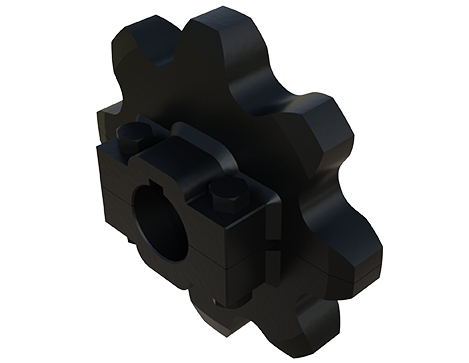 Black Ace sprockets provide long life and accurate pitch integrity to reduce operational costs in multiple industries. Thicknesses ranging from 5/8" to 4"
For convenience and reduced downtime, our sprockets are split as a standard. Pitch integrity is maintained due to our manufacturing process. The split sprocket has a dual purpose: make installation fast and easy, and clamp onto the shaft. Setscrews are not necessary with our split sprocket.